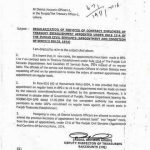 Government of the Punjab, Finance Department has issued Notification No. 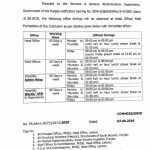 FD.PC.2-1/2011 dated 09-03-2016 in connection with Clarification Regarding 30% SSB. 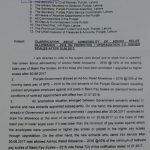 According to this Notification, I am directed to refer to the subject cited above and to state that a question has been arisen as to whether grant of 30% Social Security Benefit in lieu of pension for the contract employees is admissible upon the minimum of Basic Pay Scales 2011 or upon minimum after revision of Basic Pay Scales 2015. 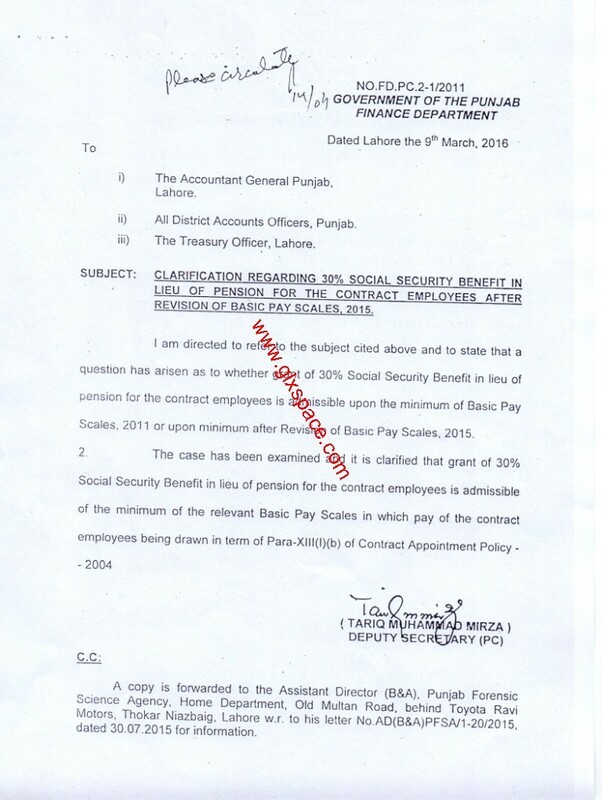 The case has been examined and it is clarified that grant of 30% Social Security Benefit in lieu of pension for the contract employees is admissible of the minimum of the relevant Basic Pay Scales in which pay the contract employees being drawn in term of Para-XIII(I)(b) of Contract Appointment Policy 2004. Special thanks to Mr. Shaheen Rehman for sending the copy of the Notification. Kis date say SSB me increase huyi hai ?? Koi arrears bhi Banay ga ? Sir,AG Punjab Lahore es ko durrot nahien kerwa sakty kia.please conform me. 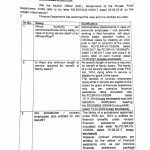 mam hamary pass contract employees hain un ki ssb30% nahien mil raha kia enko millay ga ya nahien 2015 basic pay scale. please inform me. 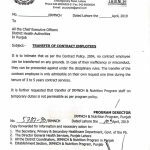 i contact with concern person in DAO for 30% Social Security, he said to me, " that there is problem in SAP Software which is use in AG Punjab Lahore, and AG only authorized to solve this problem due to SAP Software, if you will be able to approach & correct it then automatically apply to all Punjab's contract employees. Therefore, any one can please advice me how can i solve this problem.? Your SSB will be Rs-6404 according to new pay scales. 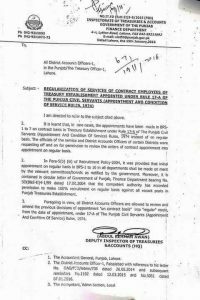 And if you are drawing Rs-2955 then claim from your establishment branch for arear as well as new SSB 30% according to this letter. 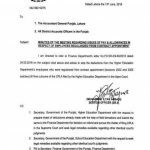 I am working in Board of Intermediate and Secondary Education Rawalpindi in BPS 17 on contract basis as per contract appointment policy 2004, At the time of joining my basic pay is Rs 16000 and social security benefit is Rs 2955. Now it is revised or not. If yes than please tell how much SSB I will get. ak hi district mein transfer ager hota hai to un ko TA/DA with one month basic pay with other allowances millain gay? please conform mr.
and what exactly it means? should it be drawn w.r.t. 2011 or 2015 BPS? It means that the 30% SSB will be on revised Basic Pay Scales 2015... .? Does that Mean, We can ask our account office regarding increase of our SSB as per our Basic pay drawn currently.?? ?